As I have mentioned before in this column, co-witnessing your red dot on an AK is the equivalent of discovering the Holy Grail. It just doesn’t happen very often and when it does, it’s exceeding satisfying. For better or worse the geometry of the AK sighting system does not lend it self to easily co-witnessing with a red dot. After all, it was designed just after the end of the Second World War. When you add a red to an AK, usually the rails or scope mount are seated just too high to afford a co-withness. This is particularly an issue with tube type red dots such as the Aimpoint or other similar sights. However reflex sights can be mounted super-low and they can more easily do the job. The Viper is minuscule and won’t upset the balance of your rifle if you place it on the fore end. Being able to use a red dot on a forward rail is a huge advantage. 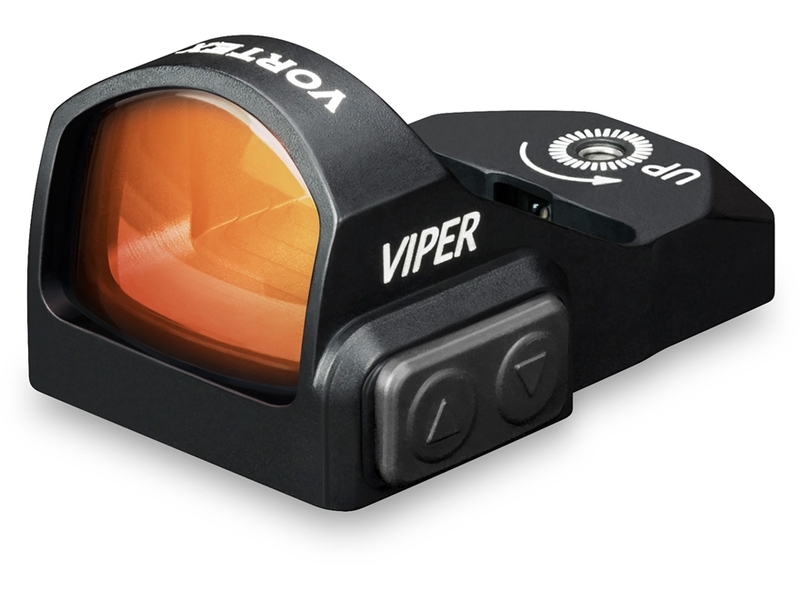 Unlike a tube type optic, Viper’s reflex technology will not cause eye relief problems if the sight is mounted far from the eye. In other words, mounting the sight on a rail over the gas tube, near the front sight, is not an impediment. You can easily see the dot without straining your eye in the least. In fact because the dot is further away from the eye, it’s going to look crisper than one mounted closer to your eye. You could use this sight closer to the eye, but in my opinion it’s just as effective mounted further away. With this perspective you also can gauge what’s going on around you rather than just being focused on the optic. Another attractive item is the Vortex “VIP” warranty. They will repair or replace your Vortex product in the event it becomes damaged or defective—at no charge to you. If they cannot repair it, they will replace it with a product in perfect working order of equal or better physical condition. Pretty unbeatable. I also called their tech support to sound them out and was impressed. They were patient and I got someone right away. No waiting. This may have been a fluke but that was my experience. If you need a decent quality, lightweight red dot for your rifle, this will work just fine. At $229 on Amazon, it’s not going to break the bank, and, it’s a good value.